As one of the jury captains for the inaugural year of the Core77 Design Awards, I am calling upon all Putting People First readers to spread the news about the award and help us get as many strong entries as possible. 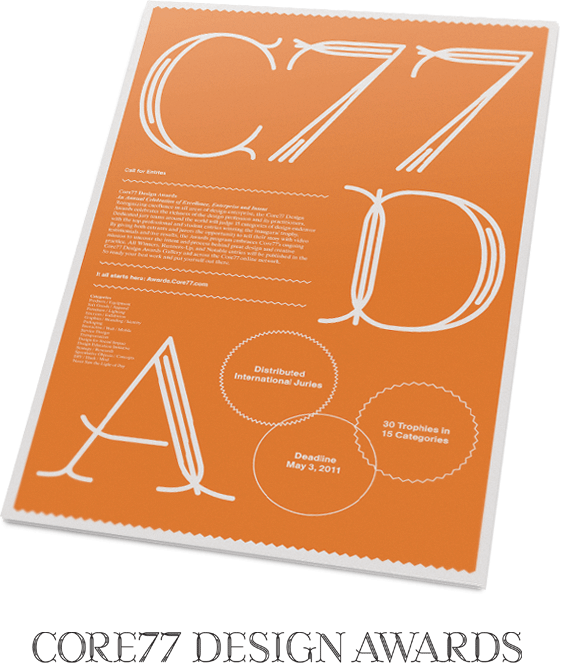 Recognizing excellence in all areas of design enterprise, the Core77 Design Awards celebrates the richness of the design profession and its practitioners. Dedicated jury teams around the world will judge 15 categories of design endeavor with the deadline for entries May 3, 2011. 1. Video Testimonials – Participants get to share their “real stories” with the judges personally and directly via short video submissions. Intended to be easy to make – videos can be low-tech, look-into-the-webcam recordings – these testimonials provide a unique opportunity to get across the intent and notable aspects of a design in a way that text and jpegs can’t. 2. Global-Local Judging – Bringing together the field’s brightest design minds, Core77 has selected 15 Jury Captains to lead 15 juries distributed around the world in cities such as Tokyo, Turin, San Francisco and Sydney. This unique judging process balances a broad global perspective with local expertise. 3. Live Web Broadcasts – Winners will be announced by jury teams in 15 different locations around the world – live – so the world can watch events unfold as they happen and hear from the jurors themselves the rationale behind their choices. 4. New Categories – Reflecting newer contemporary fields of practice with innovative categories such as “DIY” and “Never Seen the Light of Day,” this competition truly reflects what is happening in the wider industry and offers more opportunities to ennoble design enterprise in all forms. 5. A Trophy That Celebrates Teamwork – Breaking the mold for typical awards, Rich, Brilliant, Willing are approaching the design of the trophy with generosity in mind. Winners can flex their creative muscles by casting their own award in a material of their choice and can share the accolades by creating multiples for their team and contributors.